Nusa Dua, Indonesia: A hard-fought deal fixing a 2009 deadline for a new treaty to tackle global warming ran straight into trouble on Sunday with the US voicing “serious concerns" over its provisions. As negotiators headed home after two weeks of intense haggling, the White House complained that the agreement did not do enough to commit large emerging economies such as China and India to big cuts in greenhouse gas emissions. Not fair: A pedestrian walks past a chimney of a power plant in Beijing. The US says future talks must acknowledge that developed nations could not tackle climate change on their own through targeted emissions cuts, and that large emerging economies such as China had to be drawn in. UN secretary general Ban Ki-moon, who flew to the Indonesian island of Bali for a lateappeal for flexibility, praised the agreement as a “pivotal first step" to tackle what he called “the defining challenge of our time." 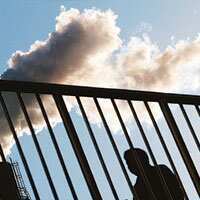 With the deal, the summit of 190 nations launched a process to negotiate a new treaty for when the UN Kyoto Protocol’s pledges on slashing greenhouse gas emissions expire in 2012. “Last night in Bali the world community decided to take a bold step into the future," Australian Prime Minister Kevin Rudd, who came to power last month and swiftly reversed the country’s previous stance by ratifying Kyoto, said in Brisbane. “But it’s only one step and we’ve got a long, long way to go." European nations and environmentalists broadly welcomed the move, although it did not go as far as many had wished by failing to specify any targets for slashing the emissions blamed for global warming. An isolated US delegation had backed down during an unplanned 13th day of talks and said it would finally accept the deal, but hours later US President George W. Bush’s administration appeared to take a step back. The White House said any Kyoto successor treaty must acknowledge a country’s sovereign right to pursue economic growth and energy security. While there were several positive aspects to the Bali deal, it added, the “United States does have serious concerns about other aspects of the decision as we begin the negotiations." The US is the only large industrialized nation to reject Kyoto, arguing it is unfair as it does not require rapidly growing emerging economies such as China to meet targeted emissions curbs. China is the world’s second largest greenhouse gas emitter after the US, and is also outside the Kyoto treaty. The White House said future talks must acknowledge that developed nations could not tackle climate change on their own through targeted emissions cuts, and that large emerging economies had to be drawn in. “Empirical studies on emission trends in the major developing economies now conclusively establish that emissions reductions principally by the developed world will be insufficient to confront the global problem effectively." British Prime Minister Gordon Brown called the deal “a vital step forward for the whole world," while German Chancellor Angela Merkel said the roadmap “opens the way to real negotiations on effective measures" for climate protection. “The road to an agreement to succeed Kyoto is still paved with obstacles," Merkel said. The agreement came after extraordinary scenes in which the UN chief jetted in for a last-ditch appeal, the UN’s exhausted climate chief nearly broke down in tears and conference chair Indonesia apologized for a disastrous procedural mix-up. “What we witnessed today was an incredible drama," said Alden Meyer of the US-based Union of Concerned Scientists. Yvo de Boer, head of the UN Framework Convention on Climate Change running the conference, said the deal broke down the divide between nations with Kyoto obligations and those without. “In that sense, what we’re seeing disappear here today is what I would call the Berlin Wall of climate change." Still, analysts warn that while the global framework for tackling climate change remains intact, the outcome of negotiations toward a new treaty depends heavily on the outcome of the US presidential election next November. “The US elections are now the single most important factor in the equation," said Steve Sawyer, a climate debate veteran and secretary general of the Global Wind Energy Council, a Brussels-based lobby for the wind-turbine industry. But the drama of Bali would be minor compared with what to expect when the road map nears its destination, said Fernando Tudela, Mexico’s under secretary for environmental policy. “The mother of all battles will be in 2009," he said. “This is just a warm-up."